Hue Light strips are a great way to run light under furniture, along corridors or the tops of kitchen units, however while this is great and there are many possibilities there are a few frustrating downsides to the lightships Philips make. The plus side is that they can be cut to length, the downside is that the cut part cannot be official reused again, and becomes waste. I say officially as Philips don’t have a way to re-use the cut part, however there are many articles on how to re-attach the used bit again, and there are also now third party accessories that you can buy that will allow this too. A single Hue light strip is 2m in length, comes with a plug and power block, this 2m strip can then be extended up to 10m in total length using extension light strips. Hue lightstrip on the left, and the extension pack on the right. Litcessory have created a few different parts that allow you to do a bit more with the light strips. It is first off important to note that to use these parts you also need the Direct-to-Controller Adapter for Philips Hue Lightstrip Plus, this comes in black or white and allows you to use the other options Litcessory offer. An easy way to add extra light strips and ideal for using this where you wish to have two runs of light strips. For instance if you wanted lights above and below kitchen units or a sideboard, then you can split it, and have one run going along the top, and the other run going along the bottom. The male ends of the splitter are removable, converting them to female where needed giving you the most flexibility. With the hue light system it is designed to have one continues light strip, from start to end it is all light, however there maybe a need to have a section where no light is needed, however you want to keep the strip going. For example, you are running it around your kitchen and then you need to go past your extractor or sink, at this point you may not want the light to be on, so this is where an extension part is ideal. A section that can be attached in-between the light strips allowing you to keep the run going without the need to a continuous run of light. If you require an extension run to where you need your light strip to be, then using an ethernet cable is a cheaper, easier and also smaller way to do this. 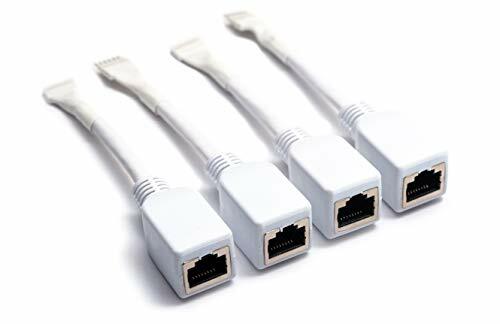 By using an ethernet cable it is a smaller cable making it easier to position and run where needed, you can also have it at any length you wish making it also cheaper as ethernet cables can be picked up for very little cost no matter the length needed. Connecting to the controller this allows you to easily extend the length of the cable by just using a network wire, there are no limits to the length and is easy to do, these fittings also make it easier to reuse as you can easily just drop in longer cable if needed if you move the set up or re-use these parts again. The best thing to do is to just bend it carefully over itself to get the angle you require. Instead of fixing the corner down fix the two points it comes away from the bend, leaving the corner free. By doing this is saves the need for a connector which isn’t really needed as the light strip itself is flexible enough to bend to the degree required. The Hue Light strip extension lead comes with a small connecter that makes it easier to bend around corners, this would connect in-between the light strip at the connector points. The downside with this, is that you cannot use it on cut light strips, so the connect will have to be used where ever your join is between the light strips. If you do cut your hue light strip then first off make sure to cut this in the cutting zones, these off cut sections then become rubbish as they will now not work… unless you solder on some connectors which you can see done here. To do this you just need a soldering iron, some solder and the pin connectors which you will attach to the off cuts. 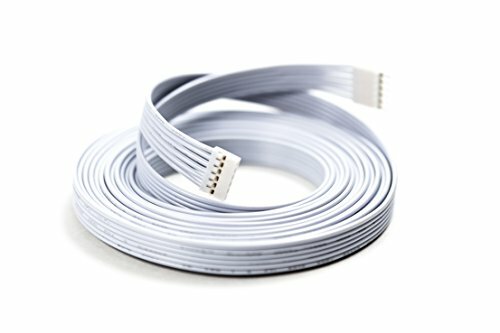 Do you know if it is possible to use the RJ45 ETHERNET CABLE ADAPTER FOR PHILIPS HUE LIGHTSTRIP PLUS in the middle of a run? I’m trying to extend in the middle of the lightstrip, so say 2 meters lightstrip RJ45 adapter CAT6, RJ45 adapter, and lightstrip again. Yes you can do as you say with this. Hi I have broken the power block and cable for my Philips hue light strip and need a replacement? Hi, I have a 2m lightstrip plus kit and a 1m extension. Is there anything special about the first 2m strip other than it is soldered on the controller? Can I simply desolder it from the controller circuit and solder a splitter cable than use two lines of strip? Is it better to to use a splitter or attach strips end to end in a line? Nothing special about either, other than one has the controller attached. Doing what you say is fine. The max length for light strips is 10m, leaving you 2m short. You could add in an extension block to give two sockets allowing you to have 2 light strip sets running around it. 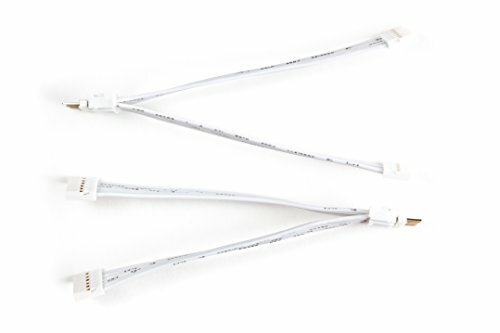 If you had one length of a hue lightstrip that is 12m, I think it will still work, the issue is the brightness and that it will be dimmer. I have bought 2m kit plus 6m of extension ledstrips (6*1m). Together it is 8m. Adapter included in the kit is for ~20W. 1m of strip drains 11,5W (or 10,5W). So after adding the extensions i need to buy a new adapter? In my case at least 92W? In Philips manual is nothing written about it. It’s just my very soft electrician skills. Could you please advice if i’m wrong? I’ve come across a 5m shape light however it’s had the power cable cut off. Is there a way I can get a new power lead to fix it??? I want to use these lights to light two audio towers. Each tower has four shelves. Would I be able to split the signal once then split each of those again to create input for 4 different 12-15” strips to place in each shelf? Also, would it be easier to just use 3 hue extension pieces to connect into the other 3 leads? Using Litcessory splitters might be a good way and then cutting your strips and soldering back together. Not sure if splitting a splitter will work though. It should, but can’t say with certain. Hi, yes you can co tool are then one light by grouping them using a third party app, also you couldn’t do 20m in one long length. i bought a strip light for my kid, 1m strip. I bought the hub separately. Neither box appears to have a power adaptor. What and where do i buy one? I don’t see extra power/controllers available anywhere. I’d like to use the extra ends rather than discarding them but my only choice seems to be a splitter and ethernet extension. What rj45 splitter can I use? I have the cat6 routed behind the wall then that needs to be split into two cat6 to go to one each led strip. My electrician have tow controller pieces (one for over the cabinet and one for under) that he cut to extend the controller cable with cat 6. the controller wires goes into a splitter box where it’s connected to the cat6 wires. Everything works well except the warm white does not turn off or dim, it’s strange that it’s the exact same on two controller wired separately, what can be the problem?